Witches & Heroes – demi gods or ordinary humans living extraordinary lives? In our Western society, the concept of demi-gods can be better understood by looking at the dual nature of Greek heroes and the theme of birth which is repeated in several myths. Here we find that always one of the parents of the hero is a God or a Goddess giving the child qualities and abilities that are both human and divine – which allows the crossing and mediation between worlds even after death. In other Pagan traditions [not to be confused with contemporary neo-paganism] where this fusion of the two worlds, human and divine, were alive we find that the idea of ​​initiation reflected this possibility where the neophyte or pilgrim was considered "reborn" as a "child" of, or protected by its tutelary deity. We find examples of such significance in rituals of initiation were Julius Gaius Cesar was consecrated to Venus and Alexander the Great to Amon. Caesar was, with every right conferred by the priests of Venus, conceived of as a demi-god - a being of two worlds walking the earth, unlike an ordinary human. The idea of ​​guardian saints found in Christianity might be traced back to practice; even thou the Church castrated the more libertine qualities of the deities, in favor of chastity. When a demi-god became a hero - and here I should point out that not all of these heroes follow a martial model of self-sacrifice - another theme is played out. They leave few offspring’s and therefore rarely an heir – in fact quite frequently the hero is not even given a proper funeral. The ‘Encantados’ (literally, enchanted ones, extraordinary people who suddenly vanishes in the forest or whilst executing heroic acts) and heroes given their extraordinary lives and lack of proper funeral would make them a part of the class of spirits known as ‘restless dead’. Further, these restless dead will then, by their spiritual constitution be found in areas where the boundaries between worlds are meeting and thus be within reach for receiving petitions from humans through the art of necromancy. In similar ways the Witches’ belief is that through blood and the vinculum made through initiation, we find the complete idea resulting in the mythical birth of the marked ones, the witches (which are known as the race of dragons; the children of Semjaza and the posterity of Cain are examples of this). She, the witch, follows a similar pattern, marked by her crucial role in creation, in ways that affirms the theme of the hero. 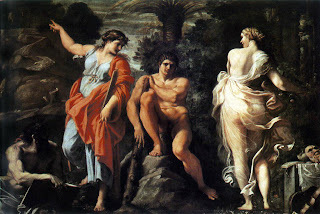 It can be the witch of the forest, the mother, or the midwife, as can be seen in the myth of Heracles  and his relationship with his tormentor and tutelary goddess, Hera. And as such, like the hero is what he is by virtue of birth, the witch who knows its ancestry will also know that there are no limits to what she can achieve in her extraordinary life. The hero by accident and the witch, unaware, are both born by the capable hands of the trickster Hermes, and whether you fall away from a life extraordinary or rise to the challenge will always depend on how willing they are to break old paradigms. Heracles means litterally, ‘Hera’s Glory’.